This article is about the common household item. For other uses, see Rubber band (disambiguation). "Elastic band" redirects here. For the band and orchestra, see The Elastic Band. For the first aid bandage, see Elastic bandage. Rubber bands are made by extruding the rubber into a long tube to provide its general shape, putting the tubes on mandrels, curing the rubber with heat, and then slicing it across the width of the tube into little bands. This causes the tube to split into multiple sections, creating a rubber band. Natural rubber originates from the latex of the rubber tree, which is acquired by tapping into the bark layers of the rubber tree. Rubber trees belong to the spurge family (Euphorbiaceae) and only survive in hot, humid tropical climates near the equator, so the majority of latex is produced in the Southeast Asian countries of Malaysia, Thailand, and Indonesia. Once the latex has been tapped, and is exposed to the air, it begins to harden and become elastic, or rubbery. A rubber band's length is defined as half its circumference. Its thickness is the distance from the inner surface to the outer surface, and its width is the distance from one cut edge to the other. If one imagines a rubber band during manufacture, that is, a long tube of rubber on a mandrel, before it is sliced into rubber bands, the band's width is decided by how far apart the slices are cut, and its length by the circumference of the tube. A rubber band is given a standard or quasi-standard number based on its dimensions. Generally, rubber bands are numbered from smallest to largest, width first. Thus, rubber bands numbered 8–19 are all 1/16 inch wide, with lengths going from 7/8 inch to 3​1⁄2 inches. Rubber band numbers 30–35 are for width of 1/8 inch, going again from shorter to longer. For even longer bands, the numbering starts over for numbers above 100, again starting at width 1/16 inch. The origin of these size numbers is not clear and there appears to be some conflict in the "standard" numbers. For example, one distributor has a size 117 being 1/16 inch wide and a size 127 being 1/8 inch wide. However, an OfficeMax size 117 is 1/8 inch wide. A manufacturer has a size 117A (1/16 inch wide) and a 117B (1/8 inch wide). Another distributor calls them 7AA (1/16 inch wide) and 7A (1/8 inch wide) (but labels them as specialty bands). Temperature affects the elasticity of a rubber band in an unusual way. Heating causes the rubber band to contract and cooling causes expansion. Stretching a rubber band will cause it to release heat, while releasing it after it has been stretched will make it absorb heat, causing its surroundings to become a little cooler. This effect is due to the higher entropy of the unstressed state, which is more entangled and therefore has more states available. In other words, the ability to convert thermal energy into work while the rubber relaxes is allowed by the higher entropy of the relaxed state. The result is that a rubber band behaves somewhat like an ideal monatomic gas inasmuch as (to good approximation) that elastic polymers do not store any potential energy in stretched chemical bonds. No elastic work is done to "stretch" molecules when work is done upon these bulk polymers. Instead, all work done to the rubber is "released" (not stored) and appears immediately in the polymer as thermal energy. Conversely, when the polymer does work on the surroundings (such as contracting to lift an object) it converts thermal energy to work in the process and cools in the same manner as an ideal gas, expanding while doing work. ≈10 Royal Mail rubber bands, on a letter size guide. In the UK during 2004, following complaints from the public about postal carriers creating litter by discarding the rubber bands which they used to keep their mail together, the Royal Mail introduced red bands for their workers to use: it was hoped that, as the bands were easier to spot than the traditional brown ones and since only the Royal Mail used them, employees would see (and feel compelled to pick up) any red bands which they had inadvertently dropped. Currently, some 342 million red bands are used every year. 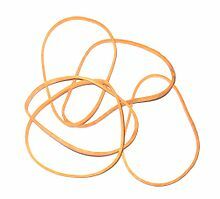 This type of rubber band was popularized by use in the military. Ranger bands are essentially sections of tire inner tubing cut into various sizes. They have the advantage of being versatile, durable, and resistant to weather and abrasion. They are commonly used for lashings, and can also be used for makeshift handle grips, providing a strong high-friction surface with excellent shock absorption. Identical loops of inner tube are used by cavers and cave divers, and in that context are called snoopy loops by the British caving and cave diving community. When they get lost they are recognizable as a common form of litter. Snoopy loops are easily cut from discarded car and motorcycle inner tubes using a pair of scissors. A knife cut may leave a notched edge which can lead to tearing. Varying sizes of inner tube are used for different tasks. Uses in caving include sealing cuffs of oversuits and collars of boots against the ingress of water, holding kneepads and elbow pads in place or securing dive lines to small rocks . and have been used for first aid for strapping injured joints tightly in place . Technical divers use small snoopy loops made from bicycle inner tubes to prevent backup lights clipped to a dive harness from dangling, and larger loops cut from car tubes are used to stow hoses against sling or sidemount cylinders. The exact origin is unknown and has been subject to much speculation. The practice of using snoopy Loops has been claimed to have originated in Greece and spotted by Cave Diving Group members in the late 1970s. The practice was then propagated in Yorkshire Dales. Another claim is that snoopy loops were named by Dave Morris, a Cave Diving Group caver who noticed how they 'snooped' around boulders. It was considered a ridiculous name at the time. None of these claims are particularly plausible as the use is obvious and is likely to have originated independently in several places at earlier dates. In animal husbandry, rubber bands are used for docking and castration of livestock. The procedure involves banding the body part with a tight latex (rubber) band to restrict blood flow. As the blood flow diminishes, the cells within the gonads die and dehydrate. The part eventually drops off. Rubber bands have long been one of the methods of powering small free-flight model aircraft, the rubber band being anchored at the rear of the fuselage and connected to the propeller at the front. To 'wind up' the 'engine', the propeller is repeatedly turned, twisting the rubber band. When the propeller has had enough turns, the propeller is released and the model launched, the rubber band then turning the propeller rapidly until it has unwound. One of the first to use this method was pioneer aerodynamicist George Cayley, who used rubber band-driven motors for powering his small experimental models. These 'rubber motors' have also been used for powering small model boats. A rubber band ball made of over 300 rubber bands. A rubber band ball is a sphere of rubber bands made by using a knotted single band as a starting point and then wrapping rubber bands around the center until the desired size is achieved. The ball is usually made from 100% rubber bands, but some instructions call for using a marble or a ping-pong ball as a starting point. The world's largest rubber band ball as of November 19, 2008 was created by Joel Waul of Lauderhill, Florida. He is currently the World Record Holder according to the Guinness World Records. The ball, which previously sat under a tarp in Waul's driveway, weighs 9,032 pounds (4,097 kg), is more than 6 ft 7 in (2.01 m) tall (which implies about a 20.68 feet (6.30 m) circumference), and consists of more than 700,000 rubber bands. It set the world record on November 13, 2008, in Lauderhill, Florida with rubber bands contributed by Stretchwell.com, a physical therapy company. The ball is now owned by Ripley's Believe it or Not!. Steve Milton of Eugene, Oregon previously held the record for the biggest rubber band ball beginning in 2006. During the construction of his rubber band ball, he was sponsored by OfficeMax, who sent him rubber bands to use for his ball. His ball was approximately 175,000 rubber bands, 5.479 feet (1.670 m) tall (circumference: 18.996 feet (5.790 m)), and weighed 2,088.14 kilograms (4,603.6 lb). He began building the ball, with help from his family, in November, 2005 and would store the ball in their garage. Before Steve Milton, the record was held by John Bain of Wilmington, Delaware beginning in 1998. In 2003, his ball weighed around 3,120 pounds (1,420 kg), consisting of over 850,000 rubber bands and is 1.52 metres (5 ft 0 in) tall (circumference: 4.6 metres (15 ft)). He put the ball up for auction in 2005, but he and his ball participated in Guinness World Records Day 2006. The bands were donated by two companies: Alliance Rubber and Textrip Ltd./Stretchwell Inc. The former world record was set in 1978. Wikimedia Commons has media related to Rubber band balls. ^ Template:Citation Rubber bands cost approximately 1-10 American Cents. ^ "March 17 – Today in Science History – Scientists born on March 17th, died, and events". todayinsci.com. Archived from the original on 2008-10-28. ^ a b c d How rubber bands are made Archived 2006-10-18 at the Wayback Machine. This reference states that the rubber is vulcanized before it is extruded. The rubber is then cured on mandrels. [unreliable source? ][not in citation given] The "Made How" reference appears to directly copy text from other sources, some of which appears to be incorrect. The exact same text regarding Thomas Hancock appears in a 1995 book entitled "CD's, super glue and salsa: how everyday products are made" by Kathleen Witman, Kyung-Sun Lim, Neil Schlager. Contradicting other sources, both credit Thomas Perry rather than Stephen Perry for the invention of the rubber band. ^ Lee Rubber Products, How rubber bands are made. Archived 2007-12-15 at the Wayback Machine This reference states that the rubber is vulcanized after it is extruded. ^ Staff. "How to measure a rubber band". www.progressinterrubber.com. Archived from the original on 7 November 2017. Retrieved 30 October 2017. ^ "Rubber Band Size & Color Chart – Big Wig Bands". bigwigbands.com. Archived from the original on 2011-08-12. ^ "sizes of standard and common rubber bands, rubber band sizes, rubber band measurements". lee-rubber.com. Archived from the original on 2008-01-13. ^ "Rubber bands, large rubber bands, pallet bands from Dykema Rubber Band". dykemarubberband.com. Archived from the original on 2008-01-01. ^ The Times: "Posties' red rubber bands stretch public's patience"
^ "Ranger Bands (Rubber Bands on Steroids)". instructables.com. Archived from the original on 2010-06-28. ^ Peter Glanville (1992). "Ten Go Caving In Sutherland". Bristol exploration Club. Archived from the original on 2007-10-08. ^ Martyn Farr. "Snoopy loops". Beyond the Blue. Archived from the original on 2007-06-29. ^ Greg Brock. "04-Aug-01: Hirlatz Hohle". Archived from the original on 2007-09-30. ^ "How to Make a Rubber Band Ball". Archived from the original on 2017-02-02. Retrieved 2017-01-23. ^ "How to Make a Rubber Band Ball". wikiHow. Archived from the original on 2017-01-23. Retrieved 2017-01-23. ^ "What IS Rubber Bands Ball". Archived from the original on 2017-02-02. Retrieved 2017-01-23. ^ a b "Frequently Asked Questions". Recordball.com. Archived from the original on April 26, 2013. Retrieved 2015-08-18. ^ "Largest Rubber Band Ball Archived 2017-12-01 at the Wayback Machine", GuinnessWorldRecords.com. Accessed: November 18, 2017. ^ Damien Cave, "In Florida, Fond Farewell for a 5-Ton Ball of Rubber Bands Archived 2017-12-01 at the Wayback Machine", New York Times (October 29, 2009). ^ "Rubber Band Ball Archived 2017-12-01 at the Wayback Machine", Ripleys.com (2009). Accessed: November 18, 2017. ^ AP. "Man Makes Rubber Band Ball History Archived 2017-12-01 at the Wayback Machine", CBSNews.com (October 30, 2009). Accessed: November 18, 2017. ^ "Rubber band ball sets record at 4,594 pounds Archived 2017-12-01 at the Wayback Machine", NBCNews.com/AP (11/22/2006). Accessed: November 18, 2017. ^ Footman, Tim; ed. (2000/2001). Guinness World Records 2001, p.252. Mint/Guinness World Records. ISBN 9781892051011/ISBN 9780851121024. ^ Guinness World Records 2005, p.104. ^ Guinness World Records 2006. ^ Williams, Chris. "Rubber band man comes to Chevy Chase auction Archived 2017-12-01 at the Wayback Machine", Gazette.net. (Oct. 5, 2005). Accessed: November 18, 2017. Wikimedia Commons has media related to Rubber bands. Wikimedia Commons has media related to Elastic. http://benkrasnow.blogspot.de/2016/08/a-refrigerator-that-works-by-stretching.html - A refrigerator that works by stretching rubberbands.